NCIS: GIBBS' RULES — 2015 Complete List of Gibbs' Rules! 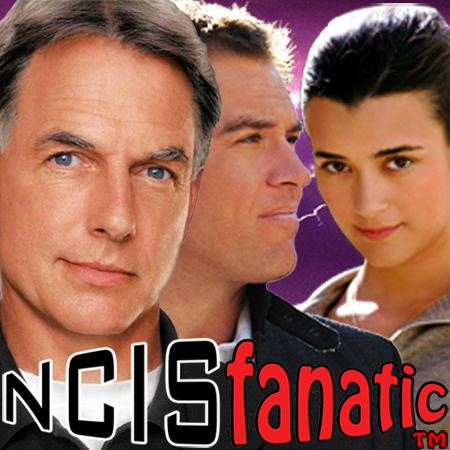 - NCIS: GIBBS RULES — NCIS — Complete List of Gibbs' Rules! 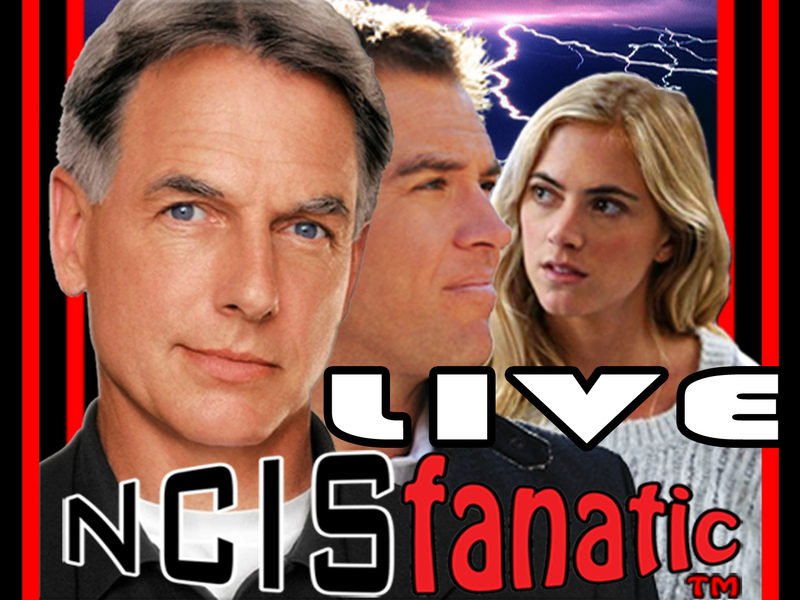 NCIS: GIBBS RULES — NCIS — Complete List of Gibbs' Rules! NCIS: GIBBS' RULES — 2015 Complete List of Gibbs' Rules! Rule #1: Never let suspects stay together. Rule #2: Always wear gloves at a crime scene. Rule #6: Never apologize — Its a sign of weakness. A rule used more often than the others, but finally given a number in 7x12 'Flesh and Blood' during a great Gibbs/DiNozzo moment. The first person to use that phrase was John Wayne in, "She Wore a Yellow Ribbon." "Never apologize, mister, it. It's a sign of weakness." — In the episode 3x23 'Hiatus Part-1' DiNozzo explains to NCIS Director, Jenny Shepard, that Gibbs took this one from "The Duke himself." "The 40's are for Emergency Use Only!" In 3x05 'Switch' we learn there are actually about 50 Rules. In 3x15 'Deception' the writers seem to have forgotten that they already used Rule #3. A new Rule #1 is given in episode 4x11 'Blowback' creating another duplicate. Some have speculated that the original Rules #1 and #3 are actually 'Crime Scene Rules' and not Gibbs' Rules. 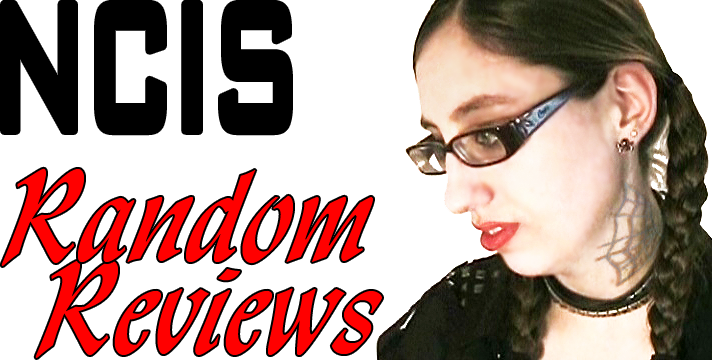 There are also theories that because the rules are not written down, the numbers may be fluid. Regardless, we now have two versions of Rule #1 and Rule #3. However, with the Season 7 Finale 3x15 'Deception', we have some clarification that Gibbs' Rule #3 is actually "Never be unreachable." At the end of the episode, Rule #3 is visible on a scrap of paper inside the box. 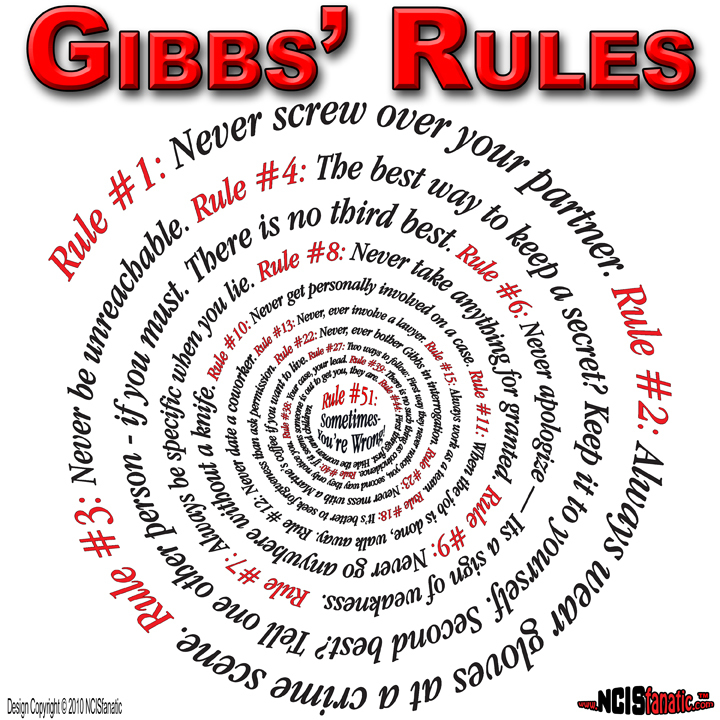 That makes sense because Gibbs' Rule #3 wasn't mentioned until season 3 when the writers had put at least a little thought into Gibbs having a set of rules. Using that theory, it makes sense that Gibbs Rule #1 is "Never screw over your partner," mentioned the first time in season 4. 1. His apology to Kate for being late to her funeral. (and arrested) by the DC Metro Police. 3. His apology to Franks because of his amnesia. 4. His apology to Ducky following his return from Mexico. 5. His apology to Joann for not being able to protect Shannon and Kelly. 6. His apology to Abby in the Season 7 Finale, Rule Fifty-One. Season 7 — Rule #44, Rule #45, Rule #51: Gibbs mentioned Rule #44 In episode 7x23 'Patriot Down' when sending a warning to Mike Franks, explained in the Season Finale as, "First things first. Hide the women and children." Rule #51, "Sometimes — You're wrong," was given during the Season 7 NCIS Finale 7x24 'Rule Fifty-One' and Rule #45 was mentioned without an explanation. Season 8 — Rule #5, Rule #16, Rule #35: After a long wait, two new rules were introduced in 8x22 'Baltimore' an episode that finally revealed how Anthony DiNozzo became an NCIS agent. Rule #35, "Always watch the watchers" and Rule #5, "You don't waste good" …Gibbs' mentions Rule #5 and tells Tony, "You're good." Later, In the Season 8 Finale, Tony mentions Gibbs' Rule #16 to E.J. Barrett, "If someone thinks they have the upper-hand …break it!." Seasons 9+ — Rule #14, Rule #20, Rule #36, Rule #42, Rule #62, Rule #69: Highlighted Above.